The aim of this prospective study was to compare routine MRI scans of the knee at 1.5 and 3 T obtained in the same individuals in terms of their performance in the diagnosis of cartilage lesions. One hundred patients underwent MRI of the knee at 1.5 and 3 T and subsequent knee arthroscopy. All MR examinations consisted of multiplanar 2D turbo spin-echo sequences. Three radiologists independently graded all articular surfaces of the knee joint seen at MRI. With arthroscopy as the reference standard, the sensitivity, specificity, and accuracy of 1.5- and 3-T MRI for detecting cartilage lesions and the proportion of correctly graded cartilage lesions within the knee joint were determined and compared using resampling statistics. 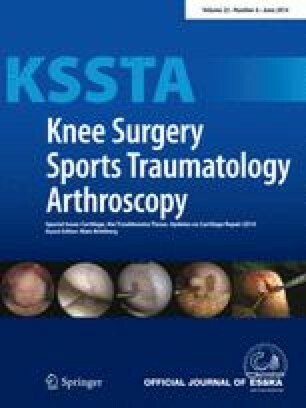 For all readers and surfaces combined, the respective sensitivity, specificity, and accuracy for detecting all grades of cartilage lesions in the knee joint using MRI were 60, 96, and 87 % at 1.5 T and 69, 96, and 90 % at 3 T. There was a statistically significant improvement in sensitivity (p < 0.05), but not specificity or accuracy (n.s.) for the detection of cartilage lesions at 3 T. There was also a statistically significant (p < 0.05) improvement in the proportion of correctly graded cartilage lesions at 3 T as compared to 1.5 T.
A 3-T MR protocol significantly improves diagnostic performance for the purpose of detecting cartilage lesions within the knee joint, when compared with a similar protocol performed at 1.5 T.